A few weeks ago, Kevin and I went up to Redding, California for the weekend. 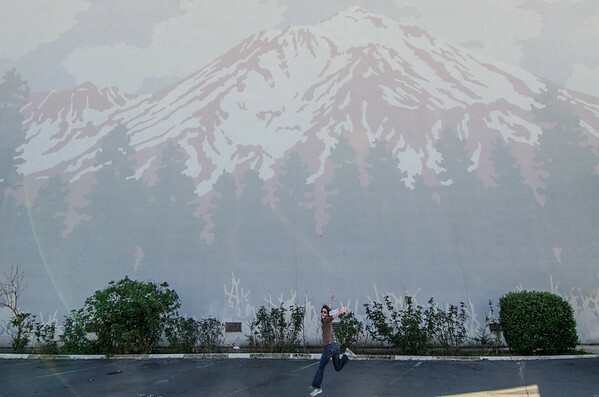 We were lured by the natural beauty of (far) Northern California and the chance to see Mt. Shasta, Mt. Lassen, and the locally famous Whiskeytown waterfalls. 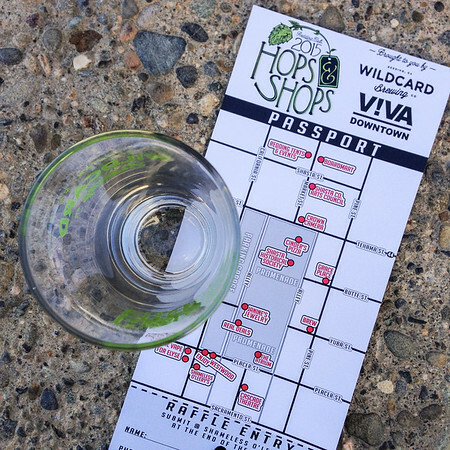 While we were there, we decided to check out an annual craft beer festival called “Hops and Shops” in Downtown Redding. I’ve been to my share of wine and beer tasting events and pub crawls, but this one offered a unique opportunity to explore the city. Here’s how it works: For $30, participants get a tasting glass, walking map of participating downtown businesses, and unlimited (!) 4 oz tastes. This is where Hops & Shops diverged from the typical “pub crawl”. 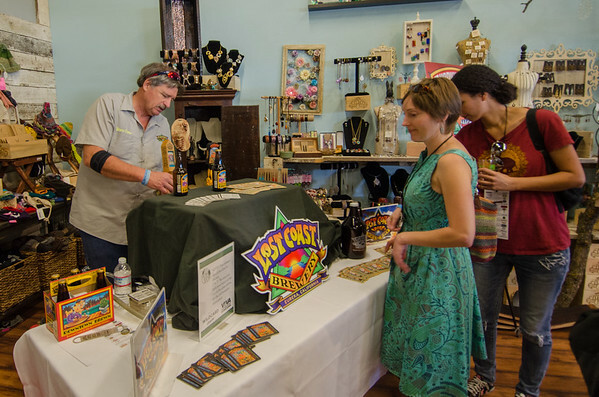 Instead of going from bar to bar, the breweries’ tasting booths were set up in an assortment of local shops, organizations, and landmarks. So in addition to learning about a different brewery, each stop gave us a look into a very different business that contributes to the downtown community. 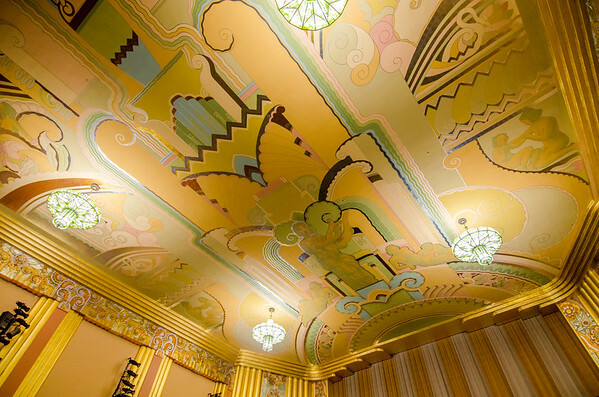 We started at the historic Cascade Theater, a recently restored 1935 art deco theater with one of the most unusual ceilings I’ve ever seen. It looked like a collage, with decopage figures and gilded design elements. After we picked up our beer, we were toured around the theater by a docent from the local historic society. He told us about the building’s $5.6 million renovation and the community support that went into raising funds for the campaign, led by the local public radio station broadcasting from offices next door. The Cascade Theater now operates a nonprofit arts center, and is a hub for art and cultural events in this northernmost region of California. Our next stop was a polar opposite: Westwood Supply, a trendy men’s clothing boutique and skateboard shop. The beer booth was set up in the back of the store, in between rows of skinny jeans and hoodie sweatshirts. After that was Brew, a local coffee roaster, Cinder’s, a wood-fired pizzeria, Grace Place, a nonprofit cafe that supports local senior services, and Enjoy, a local artisan homegoods store, specializing in “Northern California living”, run by a regional travel magazine. Most of these stops I never would have discovered were there not the promise of a cold beer inside. My favorite stop by far was the office of the Shasta Historical Society. Not only was it hosting one of the few NorCal breweries I already know and love (Sierra Nevada Brewing Company), it was another opportunity to geek out over local history. Like at the Cascade Theater, there were volunteer docents on hand to walk us around their archives. 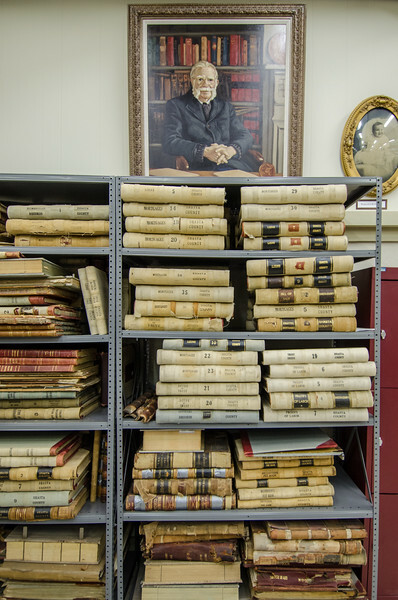 I browsed the framed photos of historic locals and decaying books of handwritten local mortgage and tax records dating back to the mid 19th century. 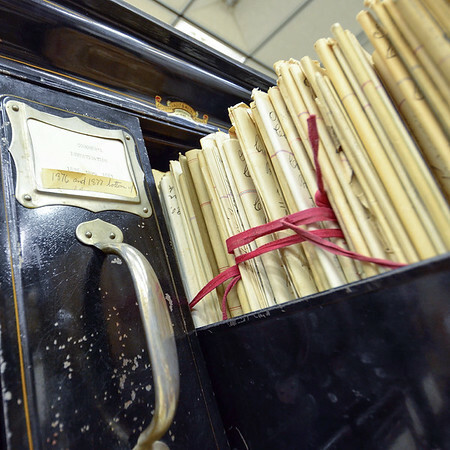 There were stacks of 100-year-old newspapers piled up on shelves and rows of handwritten coroner reports, documenting suspicious deaths as far back as 1860. The guide pointed out that the phrase “red tape” (meaning a bureaucratic government practice or policy) comes from the 19th century practice of binding government documents with red, cloth tape. It was so interesting, and again, a place I likely would not have stopped into. When I think about it, it could have been a REALLY bad idea, letting a bunch of clumsy and (literally!) sticky-fingered pub crawlers into your fancy retail boutiques and historical archives, I didn’t hear about any major beer-borne disasters (but who knows?). Personally we only had one close call when our skateboard-phobic dog, Posey, started barking at a guy zipping by us on the sidewalk, and Kevin spilled his beer all over his pants. At least we were outside–sorry, Kev! While we no doubt would have driven by the Cascade Theater and pointed out the colorful marquee in passing, I doubt we would have ever stepped inside each of these downtown businesses. The walk took us into shops we never would have found, and down streets and alleys we likely wouldn’t have roamed. It was a wonderful way to explore the downtown and learn about the local community. We were issued media passes to cover this event. Photos and opinions are my own. I put some cash into the Shasta Historical Society donation box. And bought a coffee at the local coffeehouse 🙂 The event did seem to be driving some sales, especially at the NorCal home store. They had lots of really cute crafty and artisan things. 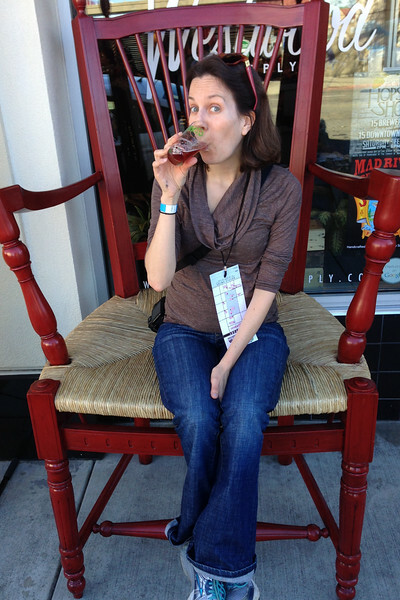 Redding’s downtown has much to offer – so glad you explored and enjoyed — and shared your story. Come back and explore the River Trail and our lovely Sundial Bridge. Hi Erin, it really does! I loved the downtown! I did visit Sundial Bridge and hiked some of the nearby trails with my dog, before visiting Turtle Bay Park. Such a beautiful place and I’m eager to come back again soon! Sounds like a fun trip! We have been considering making a stop somewhere in the Redding Area (maybe Whiskeytown) on a future road trip to Oregon, so this will definitely give us a starting point! If you like craft beer and ever find yourself passing through Lincoln or Auburn…check out Goathouse Brewing in Lincoln (http://thethriftytravelerca.blogspot.com/2015/04/donner-pass-hike-through-abandoned.html) or Knee Deep in Auburn.